Unlike the rest of the Malia Crochet-Along Patterns, which used Yarn Bee’s Rustic Romantic yarn, for this pattern I used Cascade Longwood which is one of my all-time favorite yarns. The Rustic Romantic is gorgeous but it has hemp in it, and that makes it not quite soft enough for a newborn head. Longwood on the other hand is smooth and soft and has beautiful stitch definition, and it washes up great. I made my son’s baby blanket from it and it is holding up beautifully! 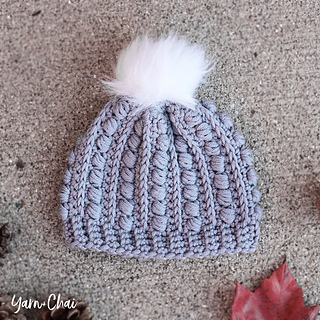 This hat uses my special faux-cinched, top-down, vertical method - meaning you begin the hat in rounds, then switch to vertical rows, and you end up with a beautiful vertical design without having to sew it shut at the end. This method produces a nice even cinch at the top. At first the method might seem confusing, but many who have tried it have ended up falling in love with it! There is a video tutorial for the adult version of this beanie that may help you as you start the hat. Your numbers will be different, but the construction is the same.